The Nutrition Facts Table is required on the majority of food products in Canada to ensure Canadians are able to make educated, informed decisions about the food they are purchasing and its nutritional content. Shows a serving size of the product and is provided in measures such as grams (g), cups, or millilitres (ml). All of the nutritional information on the label relates to the serving size listed at the top. Compare the serving size quantity with the volume consumed. This value is the total number of calories contained in the serving size listed. The percentage shown beside the nutrients lets you know if there is a little or a lot of a particular nutrient in a serving. Lists the total amount of fat with the quantity of saturated and trans fat. Displays the quantity of sodium included in the serving. The percent daily value is based on a maximum daily intake of 2,300 mg. Foods with 15 percent or more are considered high. Lists the total amount of fiber included in the serving. Changes to Serving Size based on new regulated Reference Amounts requirement for food. The changes are different for single serve and multi-serving packages. Increased font size of serving size and calories and added bold line under the calorie. Revised % daily values for Fat, Carbohydrate, Protein, Sodium, Vitamins and Minerals. Adding a new % daily value for Total Sugars. Changes to the list of nutrients by adding Potassium and removing Vitamin A and Vitamin C.
Adding the amounts in milligrams (mg) for Potassium, Calcium and Iron. Adding a footnote at the bottom of the table about % daily value. All food colours will be declared by their common name rather than the generic term “colour”. A new health claim will also be allowed on fruits and vegetables, informing consumers about the health benefits of these foods. 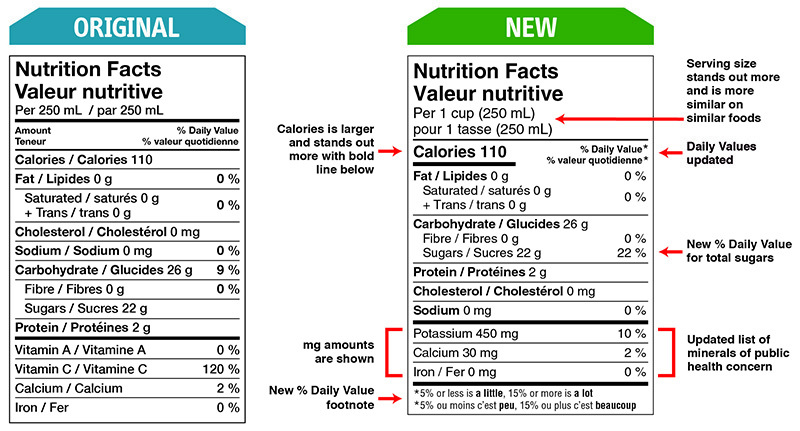 With the nutrition facts table, the Government of Canada has mandated that the food manufacturers provide the same nutritional information to allow consumers to make informed decisions. Another tool that consumers can use is to look for the Food Labels Canada Verified Label mark on products which indicates that the information conforms to the mandated government standards. The Eat Well plate helps you follow Canada's food guide when planning and serving meals. Food groups are portioned on the plate and encourages you to make half of your plate a mix of vegetables and fruit. Click Here to get started on planning your next healthy meal.